America West Airlines LLC operates as an air carrier primarily in the United States. The company transports passengers, property, and mail. As of December 31, 2006, it operated 133 jet aircrafts; and provided scheduled service at 98 airports in the continental United States, Alaska, Hawaii, Canada, and Latin America. The company was founded in 1981 and is based in Tempe, Arizona. America West Airlines LLC operates as a subsidiary of US Airways Group, Inc.
Having spent many glorious days and nights in and around Phoenix, Scottsdale, Tucson and the Southwest Desert country, we are pleased to introduce the airline that connects Arizona and other fun destinations to Western Canada via YVR Vancouver. By the way, the Arizona golf courses are superb, as was our week at Scottsdale's Mountain Shadows Resort, even though it was a mostly business affair. But business is always more than a pleasure in Arizona. America West offers two daily, non stop flights between YVR Vancouver International Airport and Phoenix, Arizona (to be featured in Air Highways South next fall). Watch for features on Arizona, Texas, New Mexico, Nevada, Southern California, Oklahoma, Louisiana, Florida and other popular "snowbird" escape destinations. America West Airlines, now the ninth largest US carrier, began operations in 1983, with 280 employees and three Boeing 737 aircraft serving five destinations. Today, America West has over 12,000 employees and 111 aircraft serving 100 destinations in Canada, the USA and Mexico. The airline offers 600 daily departures with a route system anchored by hubs in Phoenix and Las Vegas - and Columbus Ohio. The Airline now has strategic alliances with several leading domestic and international airlines. America West's airline's 'flexible fleet' plan allows the operation to grow maintain a steady growth into the new millennium, providing one of the youngest fleets in the United States. Firm commitments to acquire 321 more A-319 and A-320 aircraft through 2001, plus options for 47 more Airbuses is a key to the strategic plan. "We are excited about the addition of the A-318, which will permit the airline to replace our 737-200 aircraft early in the net decade and continue our strategy of more frequent service to key business markets," says W.A. Franke , America West Holdings, CEO. America West offers additional service to more than 35 destinations through code-share agreements with Continental Airlines, Mesa Airlines, EVA Airlines, Air China and Virgin Airlines. America West Airlines has received several awards. In 1998 for a second consecutive year, the airline earned first place for flights of 500 miles or less in the Airline Customer satisfaction - US Flights Study jointly conducted by J.D. Power and Associates and Frequent Flyer Magazine. The airline improved in nine out of 10 categories surveyed and also significantly improved its ranking in the study's long-haul flights category. Also for a second year in a row, the US. Department of Transportation (DOT) ranked America West number one in baggage-handling performance in its annual air Travel Consumer Report, a government report card designed to assist consumers with information on the quality of services provided by US. Airlines. 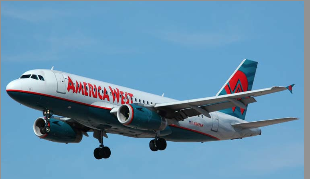 From its beginnings as a no-frills regional carrier, America West has developed into a full-service major carrier.